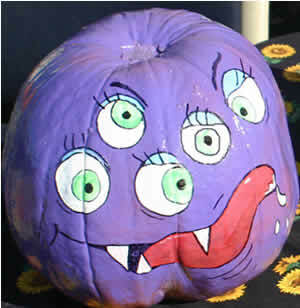 In 2002, Judy Summers was the first to send us a painted pumpkin, "Jack". 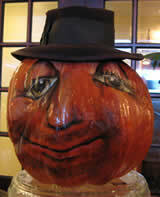 It's not something that Flo or I have done (other than my Pumpkin Head Astaire mask). 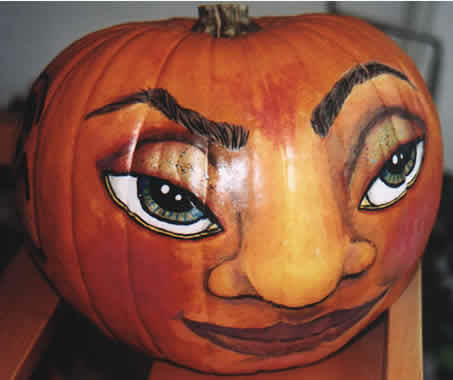 Had it not been for the unbelievably precocious painted beings that Judy has created with pumpkins and paint, we might never have agreed. Are we ever glad she found us. Since then we've had many other wonderful contributions and judging by the growing number of visitors every year, you're all glad about it too. ENJOY! 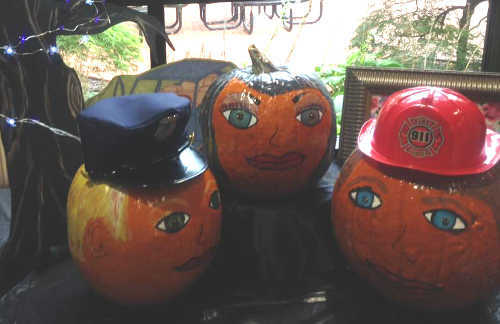 Kathy Keene is a Postmaster with the USPS in Fulton MS. She has painted pumpkins every year since about 1994. 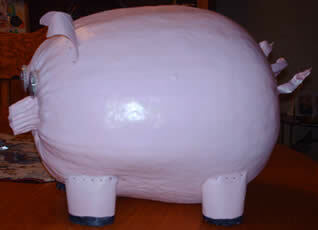 In 2012 she placed her pigs in the post office lobby to help with my Breast Cancer stamps sale. 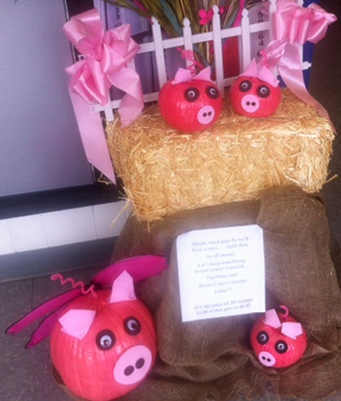 There are 3 baby pigs and the momma pig who has wings. 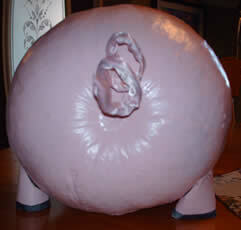 "Maybe when pigs fly, we'll have a cure - until then help fund research for the cure. 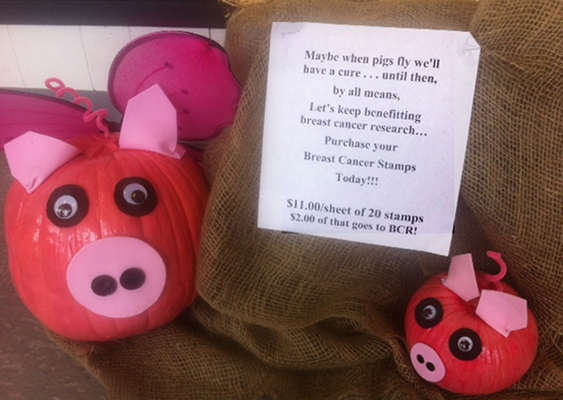 $11.00 sheet of 20 stamps - $2.00 of this goes to Breast Cancer Research!". 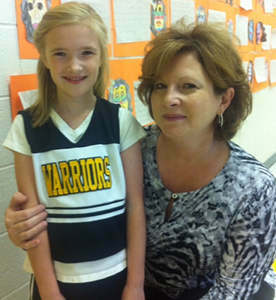 Here she's posing with one of her grandchildren. Here is Bette Davis Buckeye. Bette is quite a do-gooder. 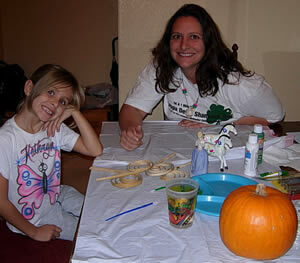 She raised $1200 in a raffle Oct. 2003 and the money went to a little boy with a rare genetic disease. Good work Bette (and Judy). 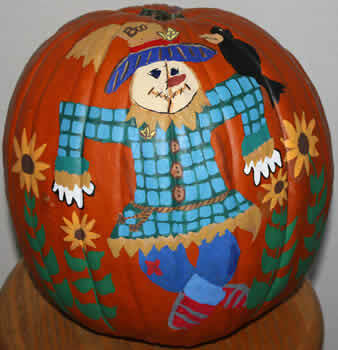 Jack was painted in 2002, but that's not what's different. His shape is what's different. He was born this way. Judy Summers found him at the farm and immediately adopted him. 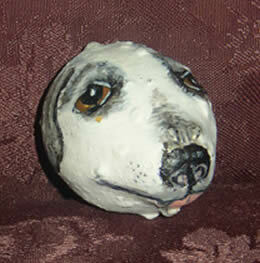 Judy painted him with acrylic and sprayed with an acrylic glaze. 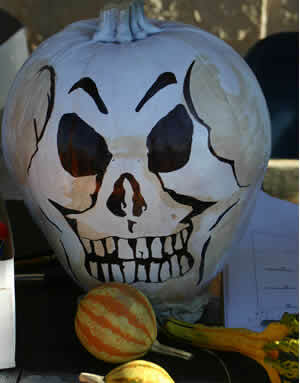 And Jack, her first pumpkin was featured in 2007 in an issue of Birds and Blooms Extra! 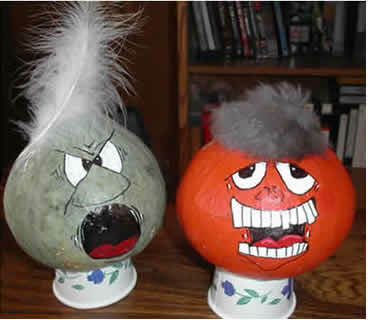 They each have been displayed at the Circleville Pumpkin Show, (the biggest free show in the US), for a week before they returned to Chillicothe, Ohio where they were auctioned off for a good cause? 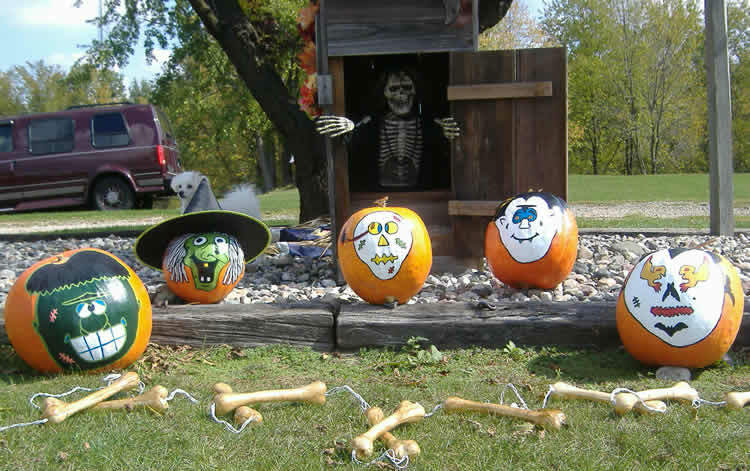 All of the pumpkins shown here have been raffled off for good causes. 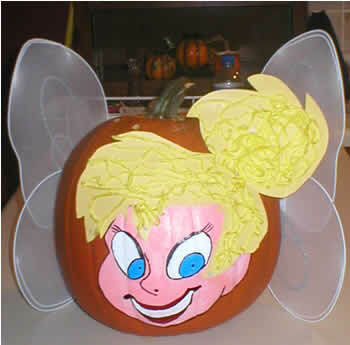 Click to see Judy's exciting pumpkin characters in more detail. "This guy (on the left) was painted for my daughter's kindergarten class in Munich, Germany. The picture (below) is "Marina and Her Annoying Younger Brother". 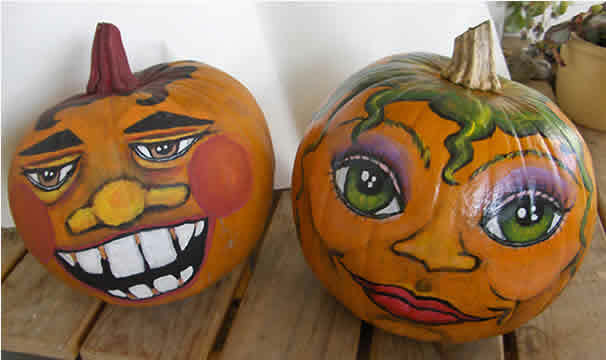 My oldest daughter named them and will take them to school with her. 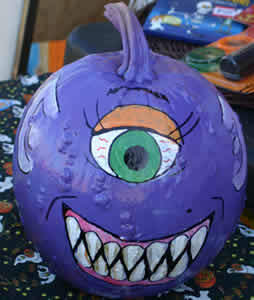 I really enjoy painted pumpkins for the obvious reason that they don't rot so quickly. 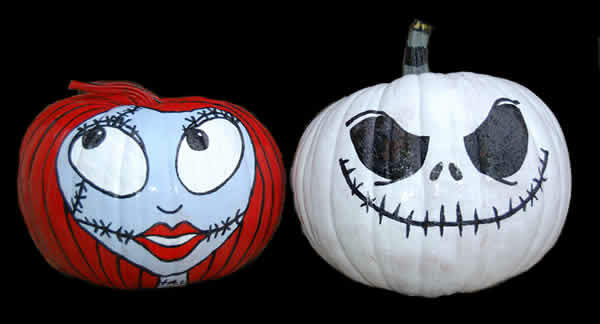 They can be painted at the beginning of October and still be fine on Halloween. 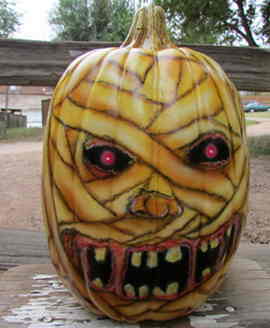 When we get closer to the holiday we will start carving! 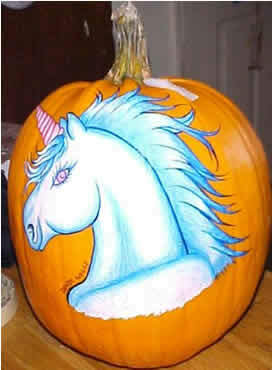 Halloween is starting to take off here in Germany but it is new. 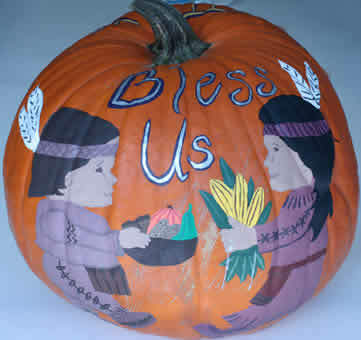 It is probably the one thing I have missed the most about the U.S. :-) "
Carol Granquist sent us these pictures of her wonderful painted pumpkins with the following touching comments. 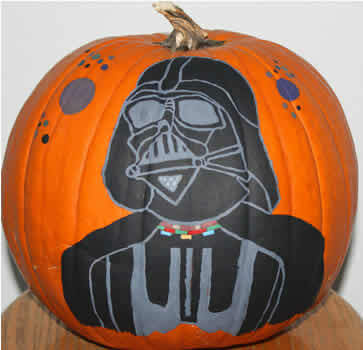 "I am a graphic designer for the Utah Schools for the Deaf and the Blind. 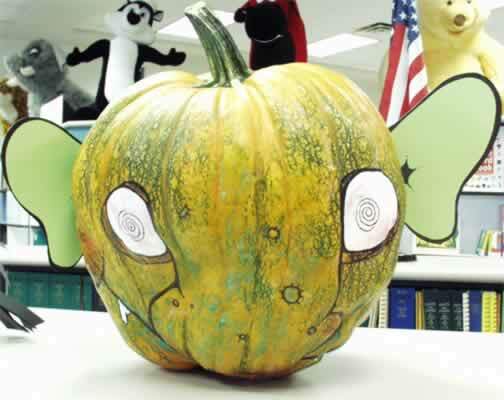 Every year we have pumpkins grow (our librarian grows some) and others are donated. 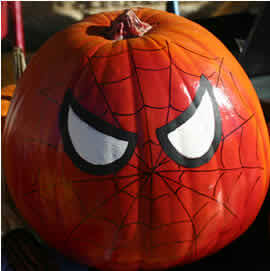 I try to find the most deformed pumpkins and paint what I see in them. 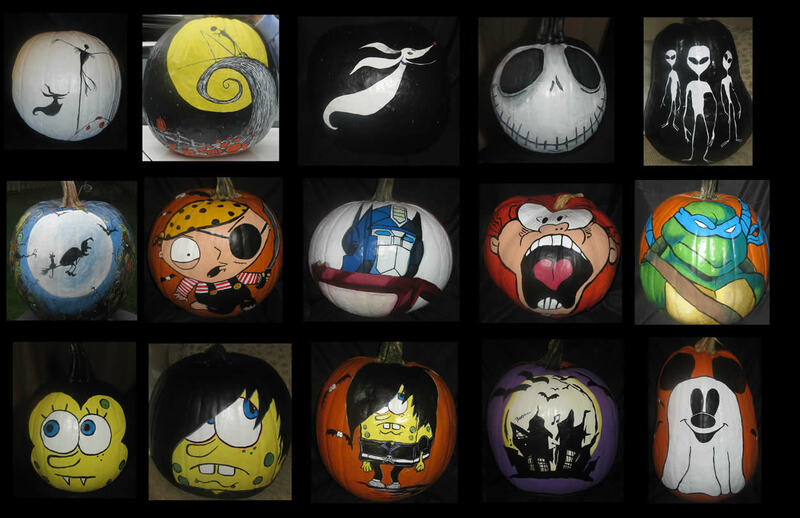 I have the privilege of painting 12-20 pumpkins for our various classes. 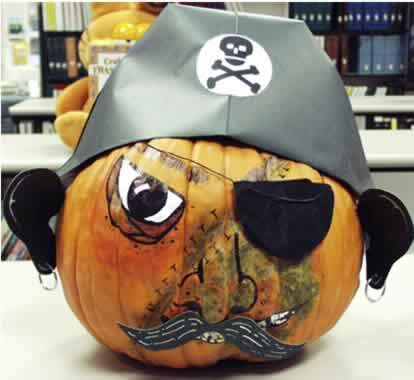 Each class comes to the library and during story time they have a drawing for one of the painted pumpkins. The special thing about all of this is that our students are deaf or hard of hearing, blind or visually impaired. 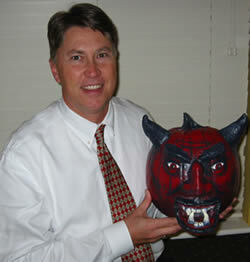 Each year, the students look forward for a chance to win a painted pumpkin. 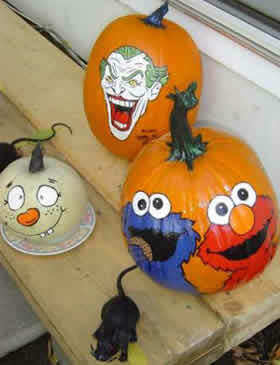 These are some of the painted pumpkins that they receive. The look on their faces when they win is priceless." 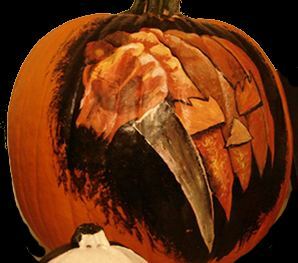 For a different approach to painting pumpkins we've discovered Dr. Pumpkinstein uses his talents to airbrush his pumpkins. 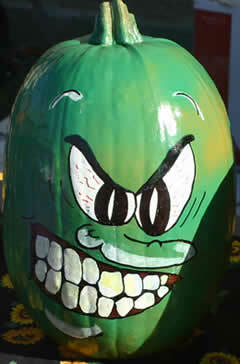 Spoony-G from Saginaw Michigan says, ".I call my pumpkins Uber Pumpkins because they have a "3-D" realistic look". 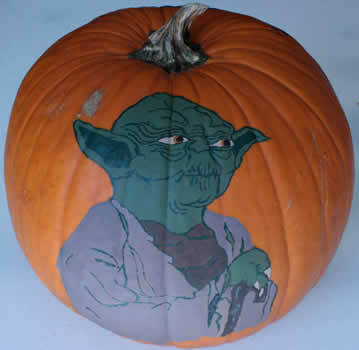 His use of Airbrushing shows more depth color and brightness then traditionaly painted pumpkins. 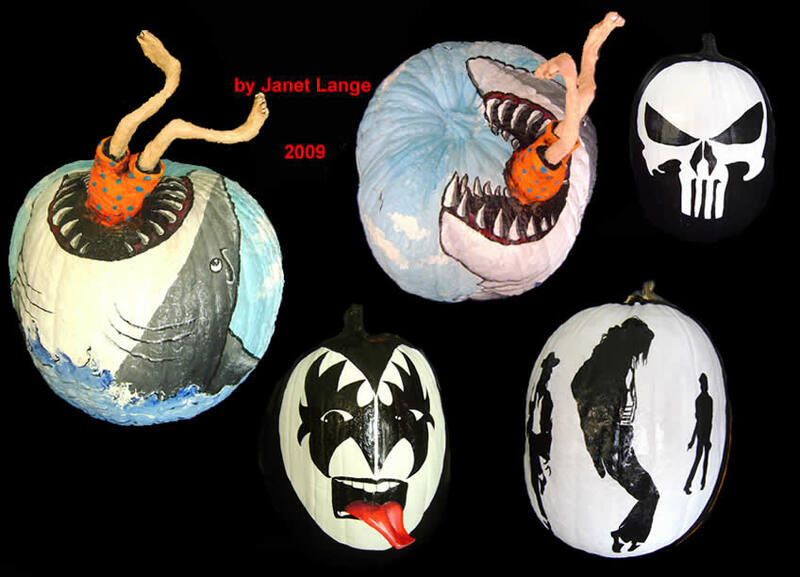 You can see more of his painted pumpkins, as well as his other works at his website. 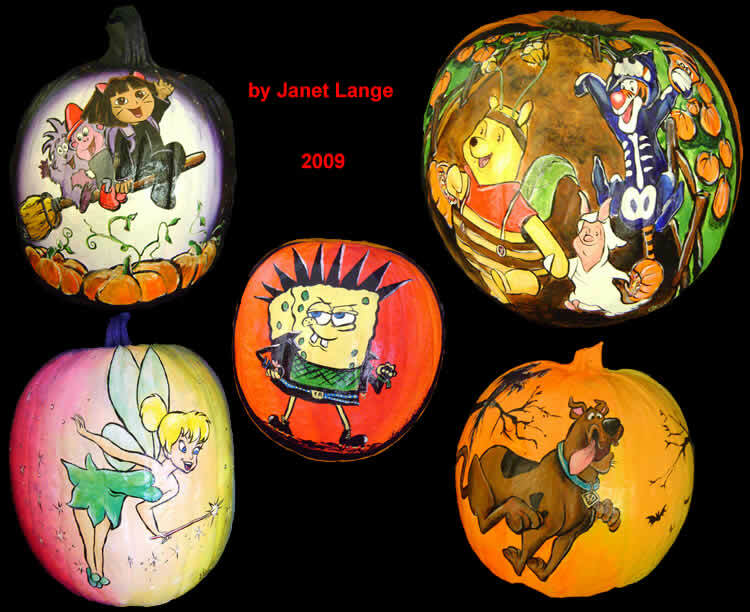 Janet Lange is a pumpkin painter as well as carver. 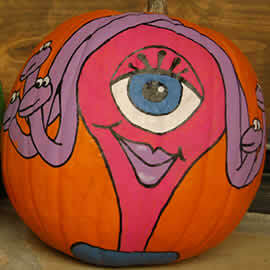 You will find more of her work at 2006 & 2007. 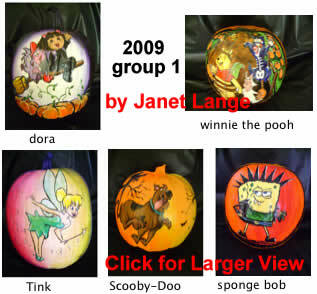 Some of Janet's pumpkins are raffled and some are sold in local festivals near Halloween. 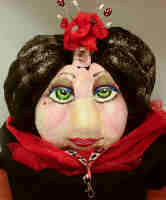 Janet also does professional face painting, art workshops in the classroom and art camps in summer, and much more. Missala takes a slightly different approach. 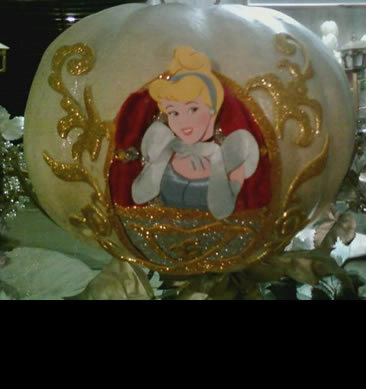 She embellishes her pumpkins to a nice effect as you can see. 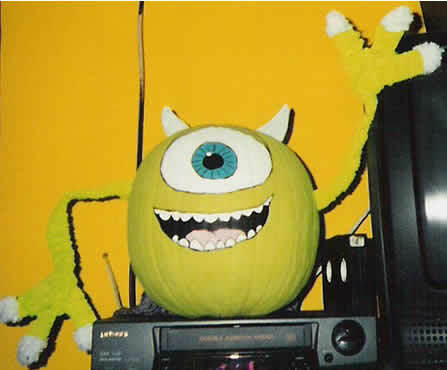 On the "Mike from Monster's Inc." pumpkin, she used coat hangers and pipe cleaners to make his arms. For her lion she bought two stuffed lions at the thrift store, took them apart and used their fur. She sewed together a few pieces around a coat hanger for the tail and even used the eyes from the stuffed animal. 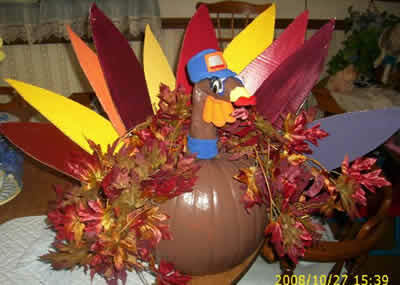 She teaches preschool and they asked us her to come up with something creative for Thanksgiving out of the pumpkins, so she made a turkey. 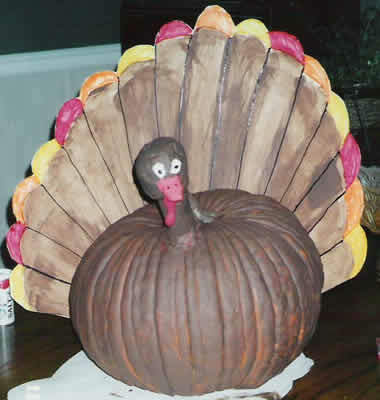 We'd like to know if she had made it into a pie - would it be a pumpkin pie or a turkey pie? 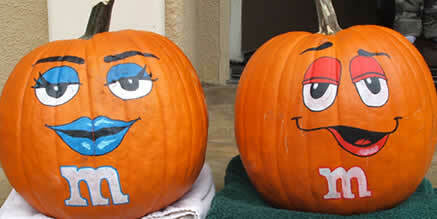 The man and woman greeted visitors on her front porch. 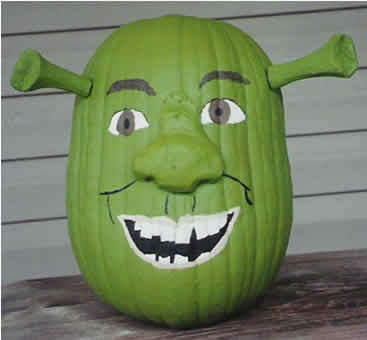 Shrek was painted in 2004. 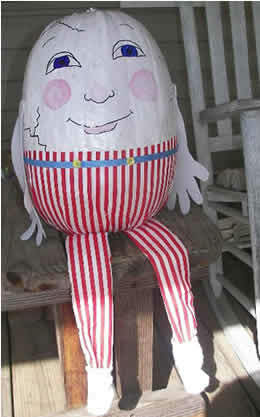 Humpty Dumpty was painted in 2007. 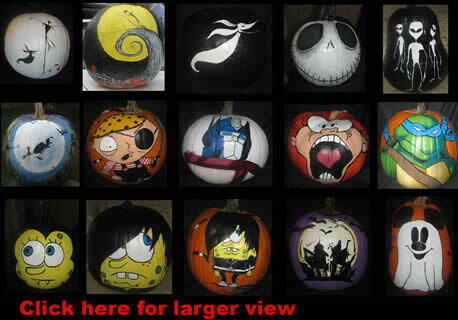 Robin Johnson (Missouri) sent in this fine selection of celebrity cartoon painted pumpkins. 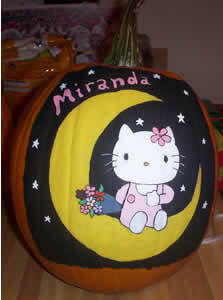 She says, "I paint pumpkins every year for my 3 children for fun. 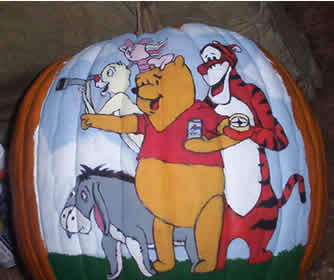 The Winnie the Pooh pumpkin is for my mom's friend and she likes Natural Light beer so that's why pooh is drinking. 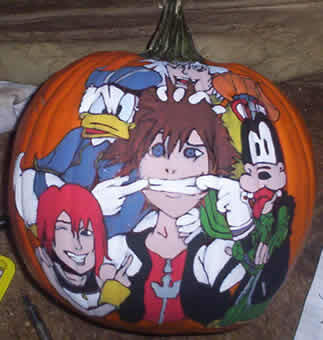 The one with Donald and Goofy on it was for my son, he is a huge video gamer So i did Kingdom Hearts for him. 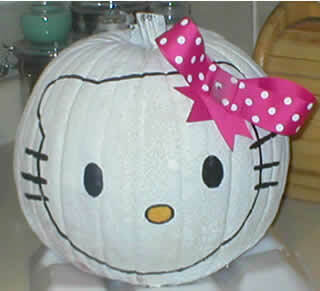 Hello Kitty is for my daughter's friend. 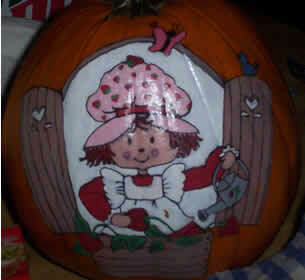 Strawberry Shortcake and It's a Great Pumpkin Charlie Brown are for my girls. I used waterbase acrylic paints and an ink pen. I think it's time to start for the holiday season. lol." 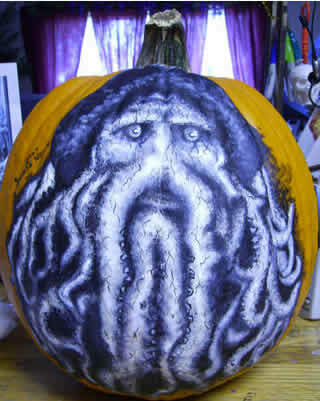 It really is the only Artsy thing that I can do." Melinda Johnston sent us the following series that her husband, Kenny Johnston, created for a pumpkin decorating contest at his job. 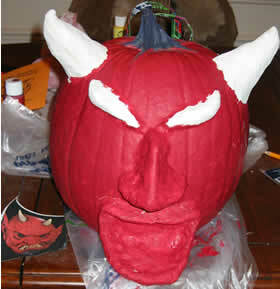 The devil won first prize in 2005 (not surprisingly). 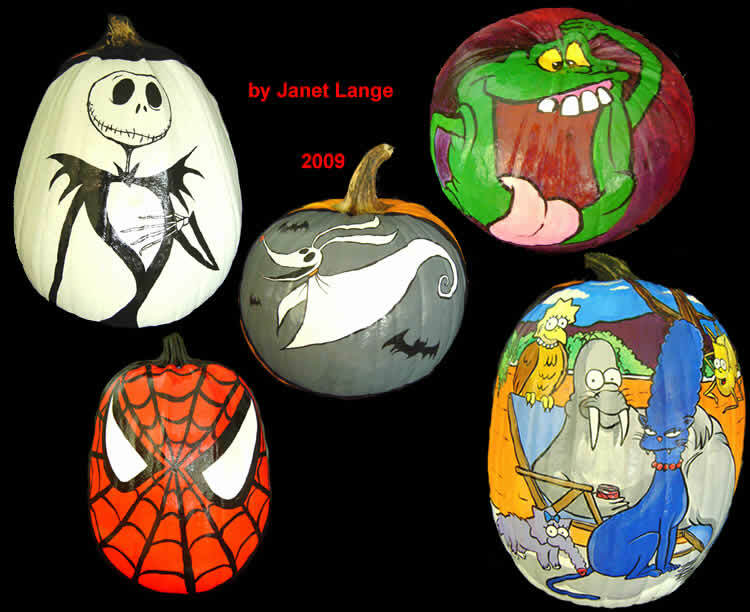 Below are the creations that Melinda & Kenny came up within 2006. Melinda added, "They may not be up to the devil of last year, but they're good (at least good enough to win the top two prizes at work again). 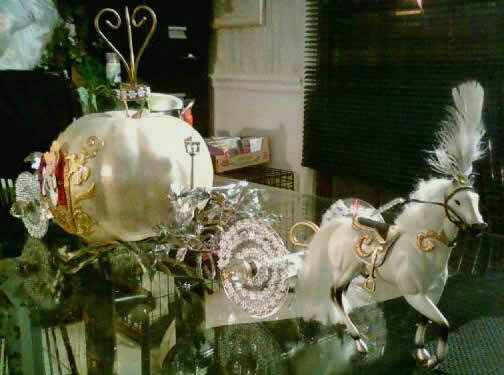 We're both very competitive, so we pull out all the stops to win every year!" 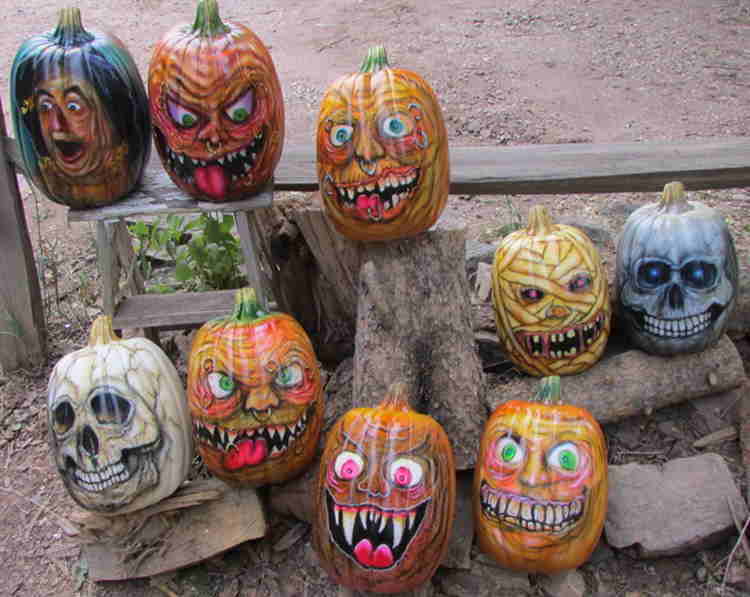 Linda Gullikson submitted this motley crew of painted faces. 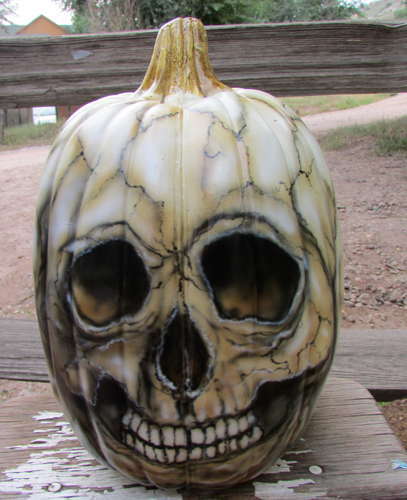 "I started painting pumpkins a few years ago when I worked in the produce department at a grocery in Lakeside, MT. 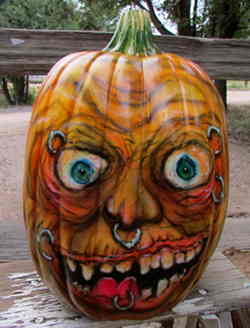 There where a lot of pumpkins that looked like they just needed a little bit of personality. 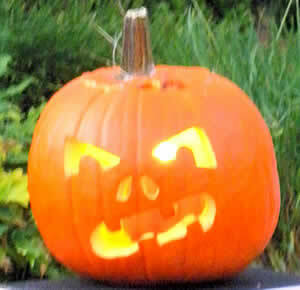 I study a pumpkin first and then decide what type of face it needs. 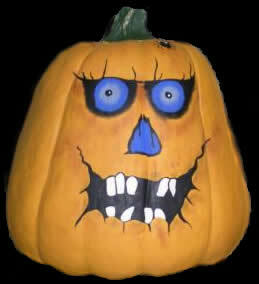 We grow lots of pumpkins and in the fall my son and I set out by the road and sell them. Of course we have a sign that says, "I'll paint a face will you wait!" 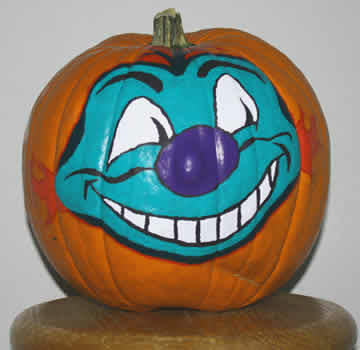 Several businesses in the area pay me for painted pumpkins because they last much longer than cut ones. A delightful bonus for having fun." 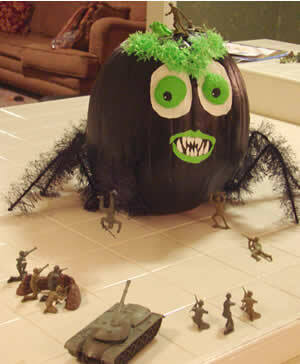 "I just can't wait to see what my pumpkins are going to turn out like while growing. 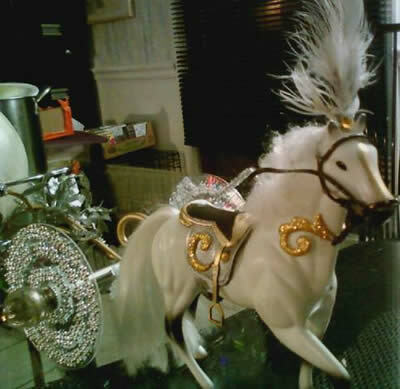 And I'm always ready to start painting them. 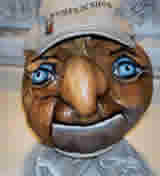 I have three to go and can't wait to think up some more faces." 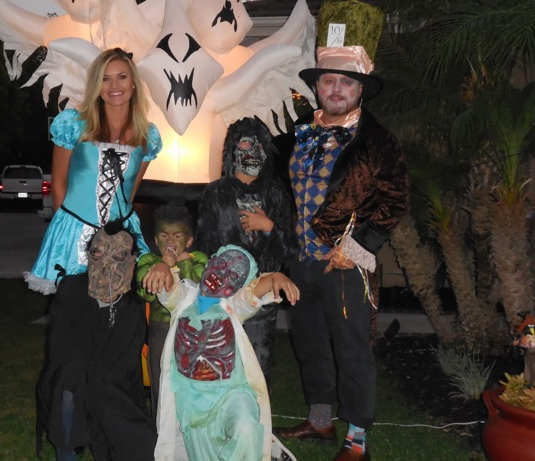 Tally with her crazy family!
" 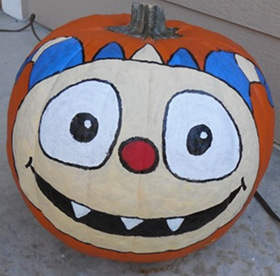 I'm a stay at home mom who let's her kids pick the theme every year, and it has become our little tradition. 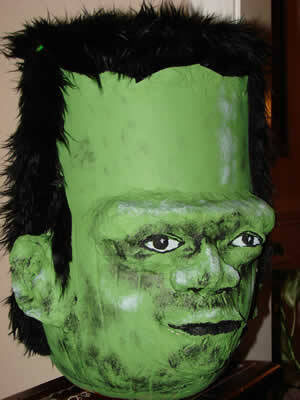 I also do character cakes for their birthdays every year. 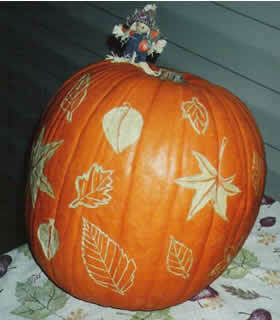 I'm not an artist, I just have fun and do my best. " 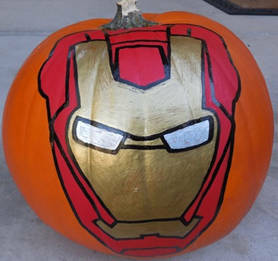 2013 - Hulk, Iron Man, & Disney's Henry Hugglemonster. 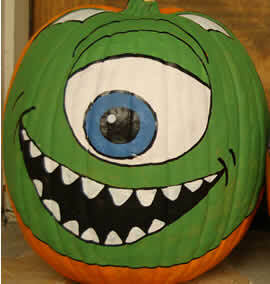 2007 - This is Tally's take on Mike Wasowski and Celia Welia from Monsters Inc. "I had to rinse the ashes off from all the fires the past couple of days to take this picture." 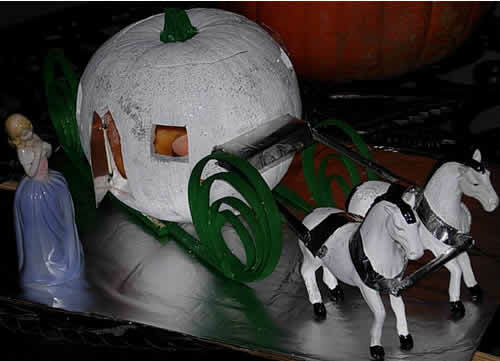 Of course, that most famous of pumpkin transformations is Cinderella's Carriage! 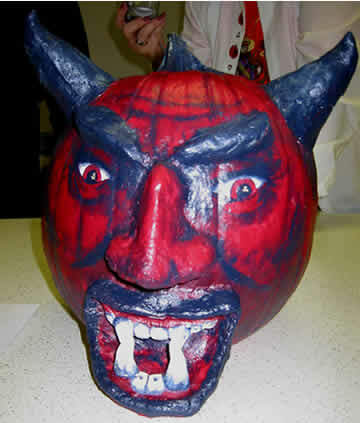 The pictures here show Faith & Kathryn with their materials and their finished pumpkin sculpture. 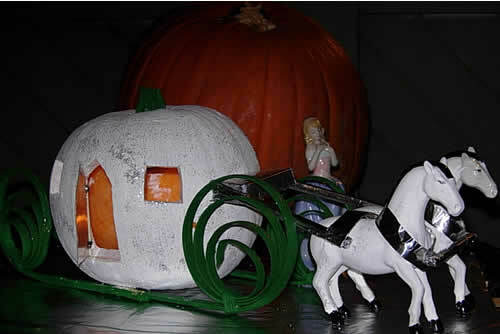 Yolanda Lopezsent in this cinderella pumpkin for 2010 complete with a plumed horse and chrystal wagon wheels as well as Disney's Cinderella watching ruefully out the coach door. 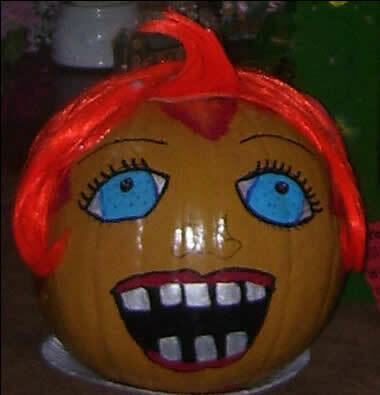 Paige Schlegel runs a pumpkin patch every year at her church, the Cornerstone United Methodist in Garland, TX. 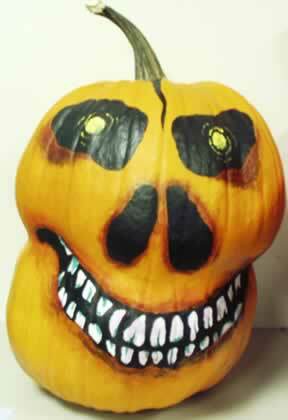 Watch out for some of these delightful faces cause some of them seem to have eyes everywhere and they may just be watching you. 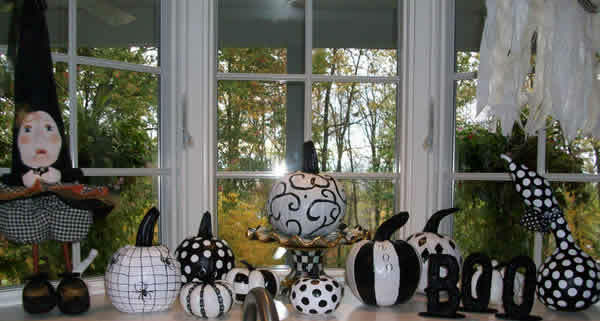 Paiges says, "The painted pumpkins are always a big hit and last so much longer than the carved ones." 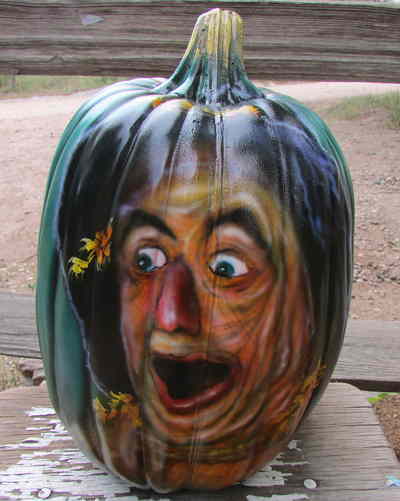 Debby Smits started painting pumpkins because she couldn't carve them. 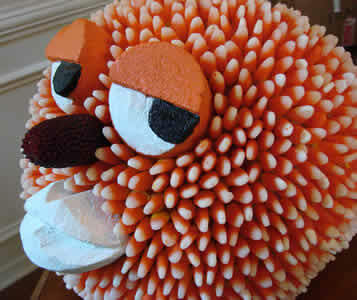 "I had alot of little friends and started to make them for the kids. Then people asked me for things that just weren't possible but to my own amazment they were ... 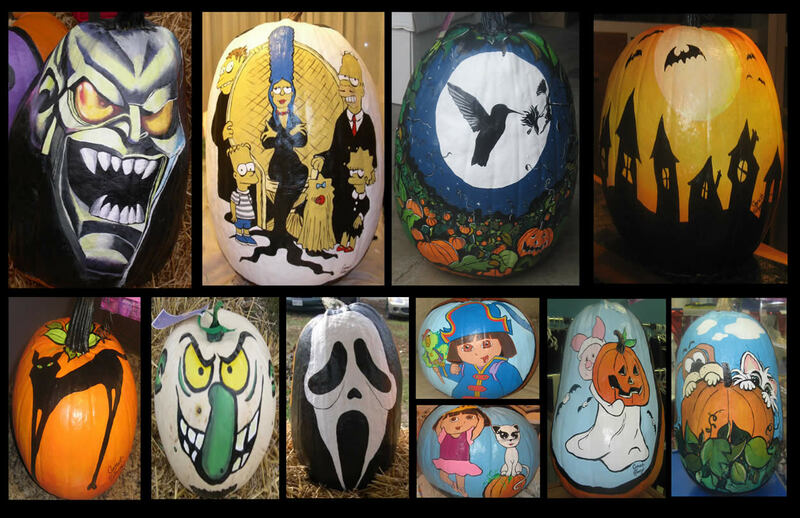 I have 20 years under my belt of painting pumpkins, and hundreds of pictures of them." Debby sent in way too many pics for one page, so we had to give her, her own page. 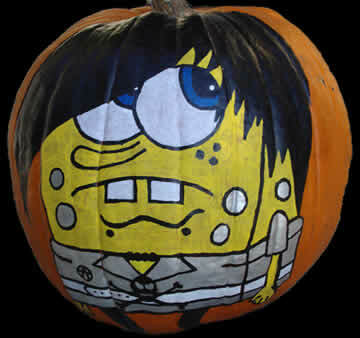 There you'll find many facets of Spongebob Squarepants, drunken bats, The Simpsons as The Addams Family, witches, skeletons, haunted house, Pooh, Eeyore, Tigger, So many that they line the stairs, and the walkways .... Click this link to see them, but watchout - she could paint you next. 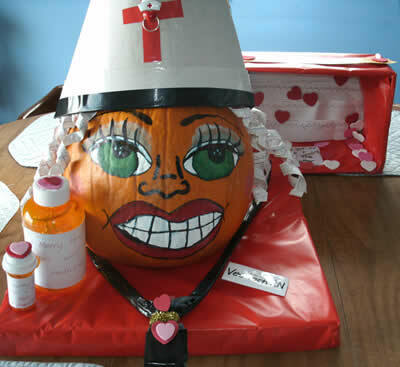 Every year since 2007, Karen has been sending us photos of her entries into her hospital's pumpkin painting contests. 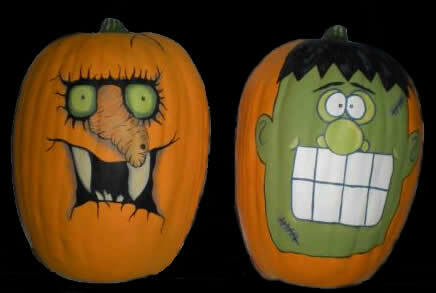 At left is Karen's 2007 entry for the pumpkin painting contest at her hospital. 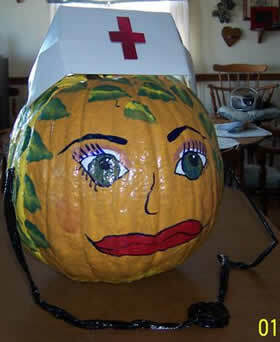 Her nurse pumpkin won the co workers of her entire unit candy apples. 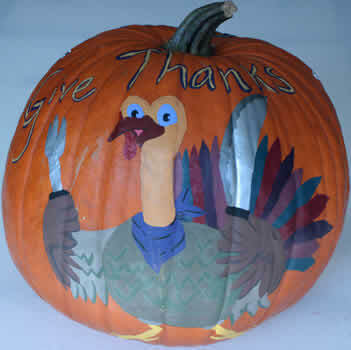 For the 2008 contest she entered this colorful turkey pumpkin. 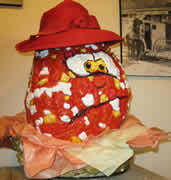 Here's Karen's 2009 painted pumpkin - The Lollipop Kid. 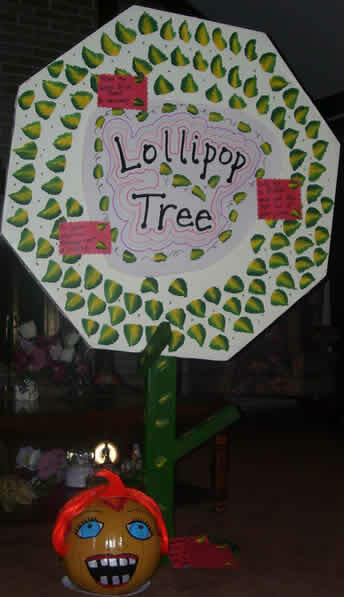 The signs on the tree say, "Follow the Yellow Brick Road to recovery" ... "Lolly up to 3 West and get the pop out of your joints" ... "Do your physical therapy and get a free lollipop"
"I transferred to the telemetry unit, so for our pumpkin contest I entered Vee Tach RN, she had a sign in her telemetry box that read, We get to the heart of the matter." 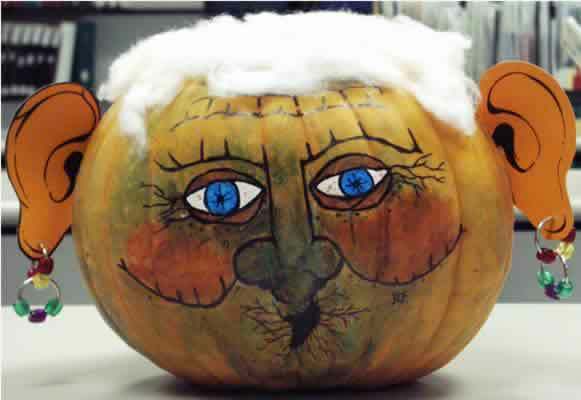 For 2011, Karen sent in another of her colorful creations. 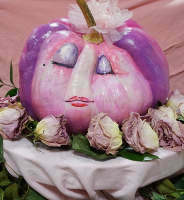 She entered it in her hometown contest and won 2nd place. 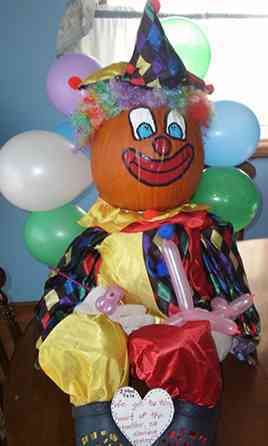 The clown's heart says, "We get to the heart of the matter. 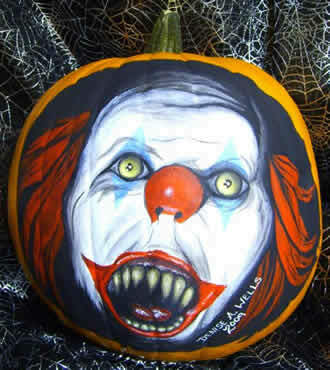 No clowning around." 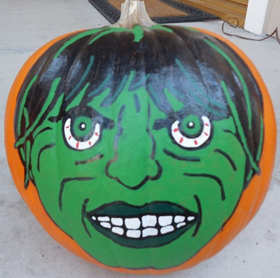 For 2012, Karen made this sculpted painted pumpkin: "The Incredible Hulk", who smashes out heart disease! The Guardian Angel (the nurse navigator) looks out over her charges as painted in 2013. 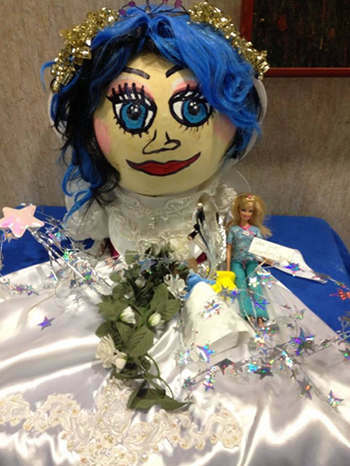 For 2014, Nurse Karen and a friend teamed up. 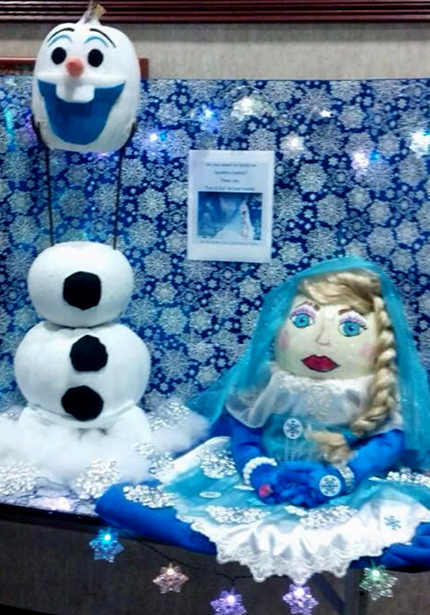 The theme, "Build on healthy habits, and say Let It Go to unhealthy habits.". The story of Disney's Frozen was a perfect choice and together they sculpted and painted Elsa & Olaf from Frozen. 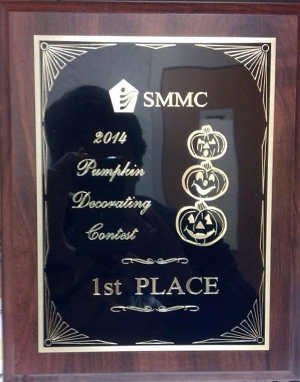 As you can see, they won 1st place! Meet Yohan. 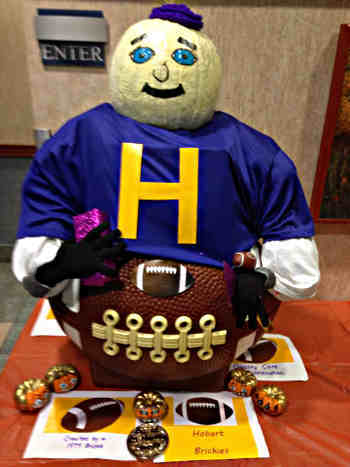 The Hobart, Indiana Brickie Mascot Hobart was originally known for having a big brickyard, hence, the "Brickie" was born. 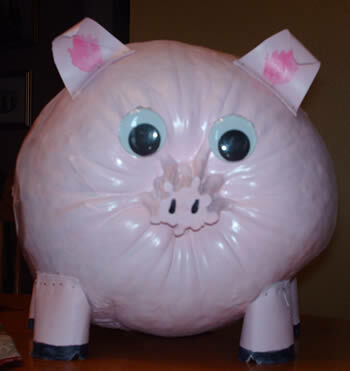 The Matizza Family "Some Pig"
fabric. 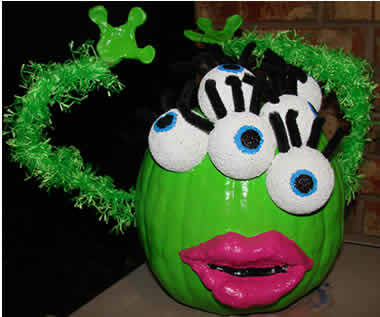 Googly eyes with hot glue. I adhered legs and ears with straight pins. Pig should last a long time! 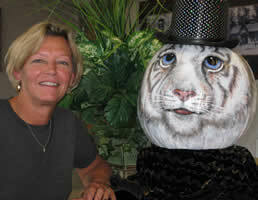 Alison Posinski, " I have been painting them for 19 years, since my daughter Meg was in Kindergarten. 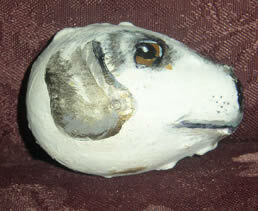 Now my grandson, Brody is in Kindergarten and I am still painting them. 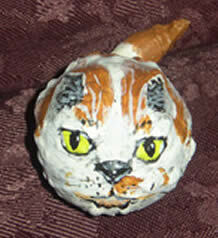 I usually paint 20 or so each year and give away some as gifts but have recently started painting on \"faux\" funkins and selling them. 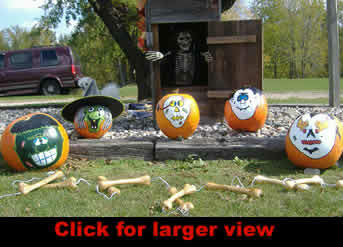 My favorites are the cute ones but my 5 yr. old grandson wanted spooky so I started that this year. Your website has inspired me with some new ideas." 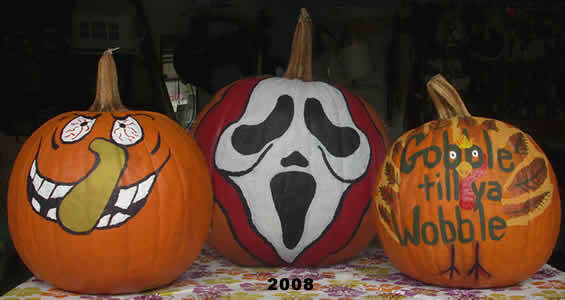 Lara sent in these pumpkins for 2008 & 2009 - She says "Your website has inspired us for 2 years now." 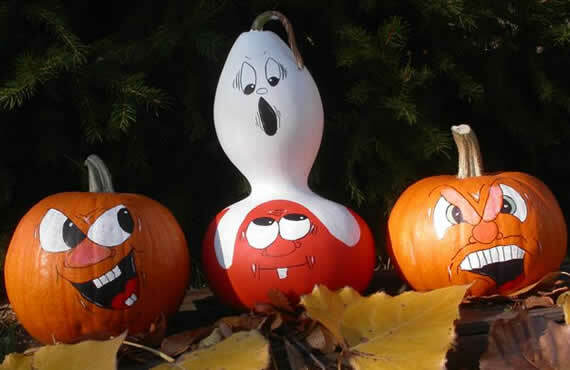 Caroline Goodrich (Tampa, FL) sent in these 3 pumpkins. 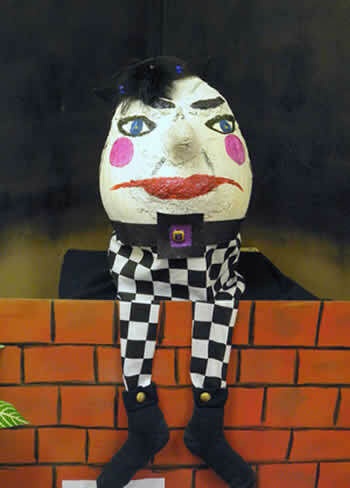 (No wonder he was pushed off that wall!)" 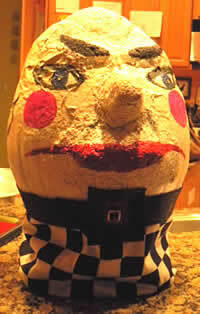 "For Pumpty, we used paper mache to create the egg shape and features, then primed, sprayed, and painted. He was a hit. 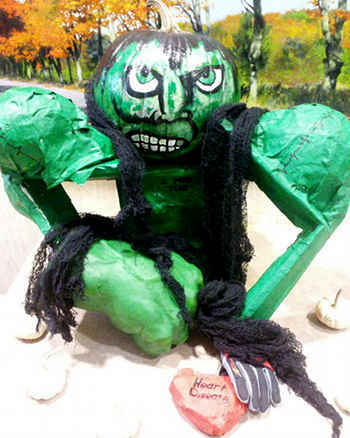 We installed him in a dark-themed vignette outside the classroom." 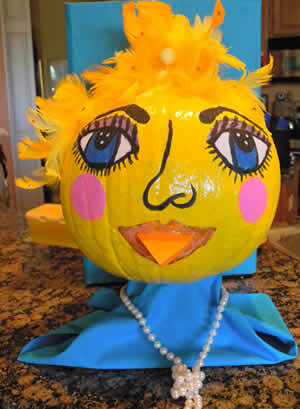 She also sent in a jack-o-lantern carved pumpkin and Chicka Chicka Boom Boom - painted with added feathers and sequins. A saucy chick, for sure. 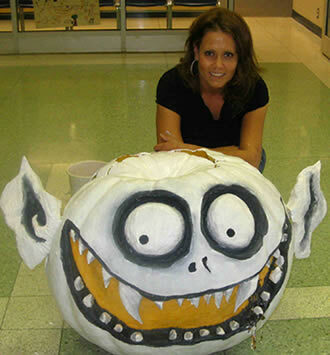 Mary Kay is from western PA, "This was my first attempt to paint pumpkins and I enjoyed every minute of it." 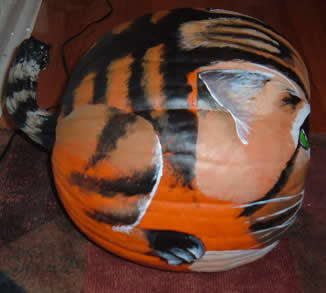 Here's my (Rich of TagYerit's) first, and to date, only painted pumpkin. 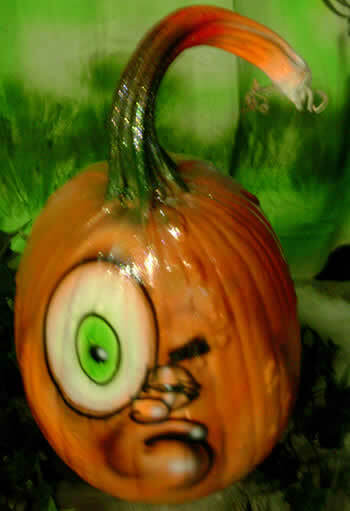 It's a foam pumpkin I picked up at Michael's to experiment with carving. 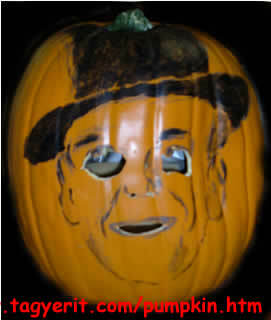 Didn't have much luck with the details I usually like to create ... instead created this mask of Pumpkinhead Astaire for my Halloween costume. 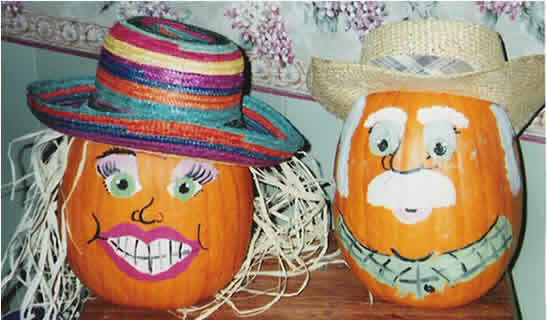 The pumpkins you find on these pages were either done by Rich & Flo Newman (aka TagYerit) or sent in by friends & contributors. There could easily be 10 pages by now, so give yourself plenty of time to explore the vast range of wonderful creations assembled here! Keep going, there's so much to see! 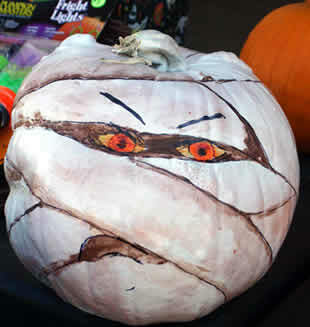 Don't stop now ... visit the following pages for more great pumpkins! 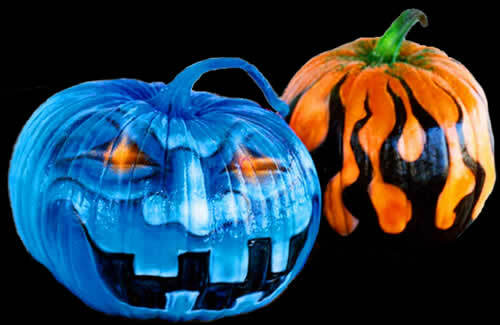 Pumpkins A-Glowing SCARY creatures to light your way. 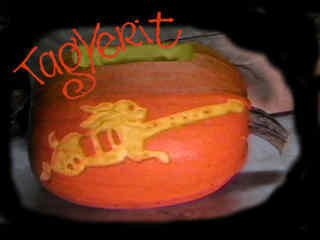 SongCarvers What happens when carving pumpkins gets songified? 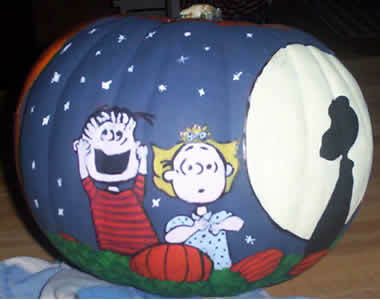 Links to other great pumpkin sites. 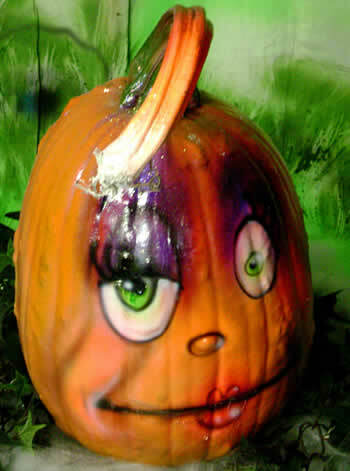 Pumpkin Highlights 2014 . . .
Pumpkin Highlights 2007 - includes Deranged Cowgirl, Tubeman, Outlaw Radio Guy (Pirate Radio Ship), and much more. 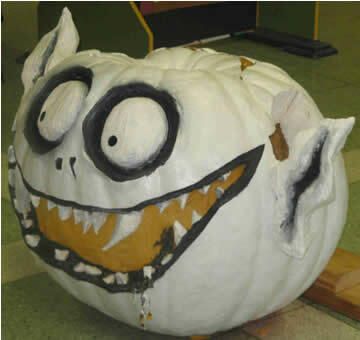 Pumpkin Highlights 2006 - includes Kabali's Diner, Pardon The Interruption (Mike & Tony), Pumpkin Head Astaire, Rosey's Hot Air Balloon ride, Yoda, Frankenstein, Col. Sanders, gargoyle, dogs, tigers and so much more. 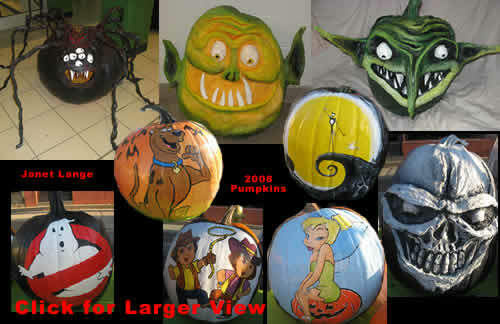 Laaarge Pumpkins - See how much more one can do with a bigger pumpkin. 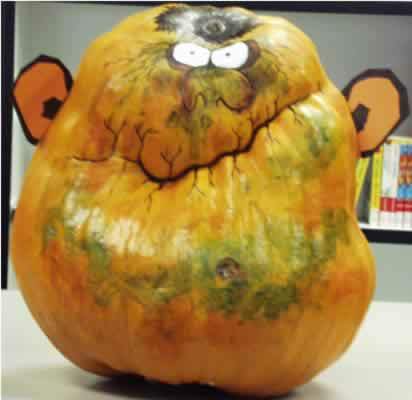 The Great Pumpkin Globe of JM Finholt - JM uses the whole pumpkin to create a map of the world. 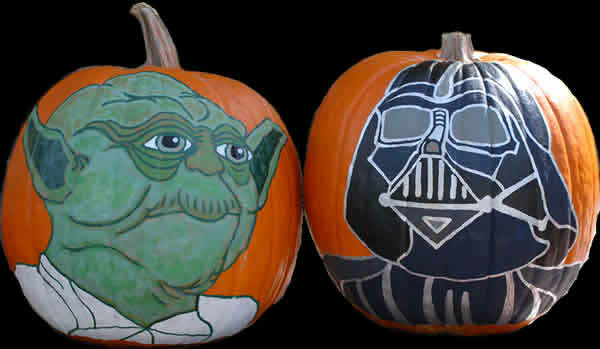 Painted Pumpkins - Some wonderful examples from our friends. 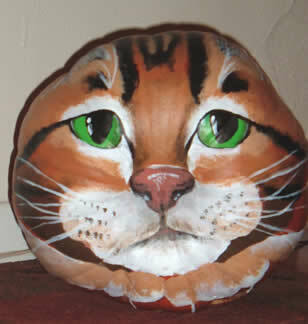 Debby Smits' Painted Pumpkins 20+ years! 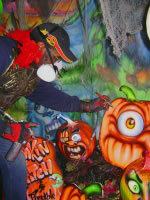 Rick's Tips - Rick Chong shares his ideas for creating inexpensive effective patterns. 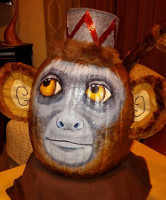 The Trick or Treat Trials - Masks, Costumes, Tricks and Treats - TagYerit's other Halloween related creations. 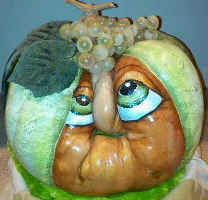 Occasionally we get requests for skilled carvers for festivals or special projects. Contact us if you're interested, and we'll do our best to facilitate. 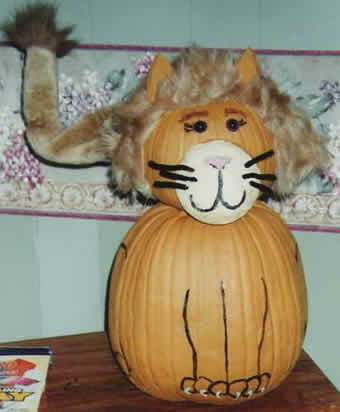 We're always interested in posting examples from carvers of all skill levels. 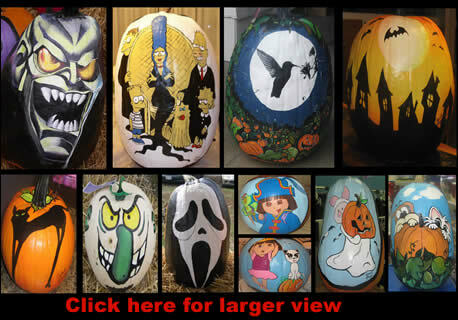 Contact us if you'd like to have your pumpkins up on our galleries.